I travelled to Dublin to help Gerry and his wife arrange their new home. 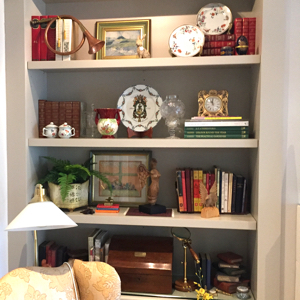 Top of the action list was to style the shelves in their elegant sitting room. I arranged each set of four to reflect a different aspect of the family’s life. They were over the moon with the results. They were also delighted that I saved them a considerable sum of money by rearranging some of the furniture and putting a much loved table to good use instead of giving it away. Now back in Brighton I’m still able to help thanks to photographs on WhatsApp and discussions via Facetime. The joys of modern technology! Get in touch if you need help with styling your shelves.